Imagine a diagnostic test that sifts through millions of molecules in one drop of a patient’s blood to detect the tell-tale protein signature of a cancer subtype. Envision a drug “ferry” that doesn’t release its cytotoxic contents until it slips inside cancer cells — or a molecule or small panel of proteins that can reveal within days whether a cancer treatment is working. Researchers have created nanosized particles and devices that are as small as enzymes — about 100–10,000 times smaller than a human cell. Because of their tiny size, nanotherapeutics can travel far and wide in a patient’s body as well as slip inside cells, delivering treatment or detecting disease in ways unimagined before now. The small size of nanodevices — such as mechanical, chemical, or electronic sensors — coupled with sophisticated microscopic plumbing networks allows researchers to analyze a host of molecular and physical traits from individual cells. A complex network of nanosized wires, levers, pores, and pipes can fit on an inch-sized chip. Radioactive, magnetic, or optical molecular probes can detect biochemical processes that distinguish cancer cells from normal cells, giving even miniscule tumors a distinctive tell-tale glow. Nanotherapeutics are large enough that kidneys don’t rapidly eliminate them, but they’re small enough to penetrate the leaky blood vessels that feed tumors (and thus transfer into tumor tissue). The ability of these drugs to reach their targets so selectively and efficiently would enable physicians to use smaller doses that are less toxic. And because they can enter cells, nanoparticles can be useful carriers for drugs that operate within cells, such as those intended to block the faulty genetic messages that fuel cancer growth. All those potential innovations and more are either currently available or being tested due to advances in nanotechnology that enable scientists and engineers to manipulate matter at the molecular scale to create particles, molecules, and devices that have novel chemical, physical, and biological properties. To explore how nanotechnology is likely to be a game changer in the cancer arena — and to gain insight as to why we don’t see more of it in cancer clinics today — The Kavli Foundation (see the “About TKF” box) recently held a teleconference with four pioneers in cancer nanotechnologies (listed in the “Roundtable Participants” box). What follows is an edited transcript of that teleconference. James Heath: Nanotechnology lets you do more with less. When it comes to diagnosing cancer or figuring out tumor response to treatment, proteins offer the most information because they are actually the machines that carry out the biological processes of health and disease. Using extremely miniaturized versions of molecular detection technologies, it is now possible to carry out a large number of distinct protein diagnostic measurements for the same price of doing a single such measurement. Those analyses are also carried out much more quickly than has been previously possible. In essence, employing these types of nanotechnologies is like wearing a new pair of eyeglasses: They can help resolve a clearer and more complete diagnostic picture of the patient. The clinical value of these new approaches is just now being tested, but the results we are finding are very promising. TKF: Is being able to make such fine distinctions especially important for cancer because researchers are increasingly finding that each type has many subtypes, and each of those could require a different type of treatment? James Heath: That is certainly an important application. A typical diagnostic test measures only a single protein. But the nature of cancer — even a single cancer type — is that it can vary significantly from patient to patient. The implication is that there is probably not a single protein biomarker that can distinguish between such patient variations. Even to confidently address a single diagnostic question may take measuring several protein biomarkers. Discovering the right biomarkers is extremely challenging. You might have 300 candidate biomarkers from which you want to choose just six, but you will likely have to test all 300 on a very large patient pool to determine the best six. That’s tough to do with existing technologies because each protein measurement requires a large sample of blood or tumor tissue, and each measurement is time-consuming, labor intensive, and expensive. With some of the emerging nanotechnologies, a large panel of candidate protein biomarkers can be rapidly measured from just a pinprick of blood or a tissue sample as small as a single cell. This allows one to accelerate the development of conventional diagnostic tests, but it also opens up the possibilities for fundamentally new diagnostic approaches. These are opportunities that nanotech is bringing into play that simply weren’t there before. Anna Barker is former deputy director of the National Cancer Institute (NCI) and currently director of Arizona State University’s Transformative Healthcare Networks. While at NCI, she created and directed the NCI Alliance for Nanotechnology in Cancer, a comprehensive initiative aimed at accelerating nanotechnology applications in cancer care. Mark E. Davis is professor of chemical engineering at the California Institute of Technology (Caltech) and a member of the Experimental Therapeutics Program of the Comprehensive Cancer Center at the City of Hope. A pioneer in using nanotechnology to deliver gene-silencing therapeutics for cancer cells, he gave the 2011 Fred Kavli Distinguished Lectureship on Nanotechnology at the Material Research Science fall meeting. prescribed cancer therapies are working and provide insights that can help increase therapeutic effectiveness. Michael Phelps is Norton Simon Professor and chair of molecular and medical pharmacology at the University of California Los Angeles. A member of the National Academy of Sciences and receiver of the Enrico Fermi Presidential award from President Clinton, he invented the PET scanner and has championed its use as a molecular imaging diagnostic for detecting, staging, and assessing therapeutic responses in patients with cancer and other diseases. Michael Phelps: When it comes to the biology of the disease, the majority of biological processes are a distraction. These processes generate tens of thousands of proteins, but you need to find the small set of proteins that control the biological functions that enable cells to transition from being normal to malignant — initially and through the various stages of cancer. You also need to find those proteins that enable patients to resist cancer treatments. One protein is not enough. You have to start with a million measurements experimentally to simplify this down to the smallest, most informative set of proteins for their clinical use in diagnosis, staging, or drug response. Anna Barker: Using nanotechnology to collect major amounts of information, Jim has shown you can capture some of the cancer pathway information that we really need to know so we can better target therapy. That’s what diagnostics has to do for cancer: You need a lot of information to actually track back and subtype the tumor to ultimately discover how its functions change. James Heath: As a normal cell changes into a tumor cell, molecular signaling pathways within that cell will significantly change. These pathways can be pretty complicated. If you Google search for images of cancer signaling pathways, you’ll pull up thousands of pages of diagrams that show these pathways as proteins connected to other proteins — sort of like what one might find for an electrical circuit diagram. To elucidate one of these signaling pathways or networks using conventional approaches is a tall order. It might take 20 or more graduate PhD theses worth of work! Even then, the results would be vague. But by applying nanotechnology measurement tools for the analysis of single tumor cells, it is possible to elucidate the entire signaling pathway in a single experiment. Such diagnostics can reveal the functional differences between one patient’s cancer and another patient’s cancer, which in turn, can yield insights into how to best prescribe therapies for those individual patients — one of the goals of personalized medicine. We just finished a study on melanoma patients in which we used such nanotechnologies to do about two million protein biomarker measurements on each patient. The resulting picture it provides us with is amazing. Anna Barker: Over the last decade, more than 1,400 proteins have been proposed as potential cancer diagnostics to the FDA, and the FDA has approved only 14 since 2001. That’s because these tests measure small amounts of the abundant amount of change going on in a tumor; they don’t provide enough information about the pathway, so they don’t hold up as diagnostic markers in clinical tests. Jim and his colleagues in nanodiagnostics are changing the whole paradigm of diagnosis in cancer because they are providing complex cancer signatures rather than just single markers. Jim’s gathering enough information so you can actually say what exactly is changing in a single cancer cell — and ultimately that’s the pathway story. James Heath: Nanotechnology is an amazing discovery tool. It’s giving us a new set of eyes that are opening up a whole new world. TKF: Dr. Phelps, how is nanotechnology changing the way cancer is detected and monitored on different scanning devices? Michael Phelps: PET [positron emission tomography] molecular imaging probes can rapidly search for cancer throughout all tissues of the body, as well as characterize each cancer lesion it detects within an individual patient. Tumors can change their biological properties as they metastasize, so there is a need to characterize the initial tumor and each metastasis. For example, a patient with breast cancer can first present a tumor in the breast tissue with estrogen receptors, but then develop metastases that may or may not have estrogen receptors. Those metastases with estrogen receptors will likely respond to hormonal therapy, while those without estrogen receptors will not respond. About 40% of metastases have a different estrogen receptor status than the primary tumor from which they spread. Whole-body PET imaging reveals the estrogen receptors in patients, lesion by lesion, to better determine whether response to hormonal therapy will be effective for all lesions. All cancer treatments are in need of better molecular diagnostics — be they in vitro diagnostics from blood that Jim is developing or in vivo approaches with molecular imaging with PET, to better characterize the biology of cancer. This provides a better selection of the right drugs for the right patients, and also quickly determines initial response to therapy. If there is a positive initial response, then the selected therapy should be continued; if not, then the patient should be quickly switched to another alternative. TKF: The way we currently determine whether a drug is effective is to wait until enough tumor cells grow back after treatment to be detected on a CT scan or MRI. But you’re saying that with nanotechnologies, we can do this quicker? Michael Phelps: Let’s begin with the fact that disease is a biological process, and the goal of conventional or nanotechnology-based drug therapies is to modify or terminate the critical biological process of the disease. The value of PET is that it provides molecular imaging diagnostics of the biology of disease. This is why PET can distinguish between malignant processes, and more benign processes, such as scarring or swelling, and quickly detect an effective outcome — dead (necrotic) tumor tissue — while CT and MRI cannot. The biological response to effective therapies seen with PET typically happens within days to weeks, unlike the anatomical changes in lesions that can be seen in a CT or MRI. These changes can take many months to occur. Conventional or nanotechnology-based drugs can also be labeled with probes so we can use PET to take pictures (images) that reveal how the drug distributes throughout the body, including how much of it hits the drug target. TKF: Are you saying that molecular imaging should replace the standard RECIST [response evaluation criteria in solid tumors] imaging criteria for tumor response, which is based on the size of the lesions seen with standard imaging? Michael Phelps: The FDA criteria for RECIST should have been changed many years ago. In addition, most all PET scanners are PET/CT scanners, so both the RECIST and the biological response from PET can be provided in the same examination. multiple targets]. When physicians try to combine chemo drugs to attack multiple targets, the combined toxicity of all those drugs often limits what they can do. But by making a component of a combination therapy [have lower side effects], nanoparticle technology has the ability to put together drugs in combinations that you couldn’t do previously because they would have been too toxic. What’s really exciting to me is the patient evidence that reveal nanoparticles are actually going into tumor cells and releasing their payloads: drugs or RNA segments (that can inhibit production of proteins fueling cancer growth and progression). The good news from the clinical studies of these nanotherapeutics is that they are revealing much less side effects than other types of drugs — and we’re not seeing any new side effects due to the nanoparticles themselves. But that’s good news only if these nanotherapeutics are also effective, and we’re starting to see preliminary evidence that these therapies are having some effects in patients while also giving them a high quality of life. Anna Barker: Since the 2005 FDA approval of the Abraxane breast cancer nanotherapeutic (using a nanoparticle formulation), the pharmaceutical industry is beginning to take more of an interest in nanocarriers for cancer drugs because they are often much less toxic and targeted to the tumor than the drugs delivered by more standard means. And as we move into this era of personalized medicine, you’re going to need the kinds of constructs we can build in nanotechnology. If you truly are going to deliver something to a targeted part of a cell, then you’re going to have to have a very specific targeting agent, a very specific delivery strategy, and a very specific monitoring strategy. The only way you’re going to get that is through these nanotechnology devices and constructs. Why all the excitement about nanoparticle medicine (nanomedicines) for fighting cancer? The Fred Kavli Distinguished Lecture in Nanoscience given by Mark E. Davis at the fall 2011 meeting of the Materials Research Society, presented current understandings of why engineered, nanosized medicines could provide game-changing ways to treat cancer. Watch a video of his presentation here: www.kavlifoundation.org/science-spotlights/fighting-cancer-nanotechnology-MRS-Mark-Davis. Anna Barker: Any drug or diagnostics approval pathway through the FDA is challenging, but as we try to translate any of these nanotechnologies into the clinic, we have to answer the added question: “Are they more toxic?” We’re still going through this phase where people are fearful of nanotechnology, just as they were fearful of recombinant DNA technology. One of the things we did at the NCI Alliance for Nanotechnology in Cancer was to set up the Nanotechnology Characterization Lab to try to help characterize a wide range of physical and biological properties of these particles, mostly to set the stage for submission of nanodevices and nanodrugs to the FDA. More recently, we invested in developing the preclinical data needed to get these nanoparticles into clinical testing. Mark will tell you it’s not easy getting these new constructs into clinical trials — and once you do, you can’t depend on classic clinical trials to advance them further. In some cases, you have different challenges than you would have with standard drugs. I’m hoping the government will put more money into preclinical and clinical studies because we need to develop new approaches to evaluate the toxicology of these agents and monitor their delivery, as well as develop new clinical trials that don’t just measure toxicity, but also (in their earliest stages) measure efficacy, so we can move more quickly into large-scale clinical tests. Anna Barker: These challenges are mostly related to perception and having the tools to demonstrate that the agent does what you say it does. It’s more difficult for nanotherapeutics than for other drugs because they employ a new set of technologies that the FDA is more guarded about approving. The FDA is responsible for the health of the American public, so they are very careful about putting anything new into the population. So the challenges have to do with showing you can deliver what you said you were going to deliver to the target — and that the toxicity and distribution of the agent in the body is what you predicted. You have to have different measures than what is included in the classic toxicology testing packages we use for potential drugs. TKF: What have we learned so far from animal and clinical studies on nanotechnologies, and what do we have still to learn? Anna Barker: Initially, we learned that a lot of nanoparticles we hoped would deliver therapeutics to specific areas of tumor cells ended up in the liver. So a lot of people around the country have been working on figuring out what to decorate nanoparticles with — a range of agents to attach to nanoparticles so they make it into tumor cells. Mark is the poster child for this kind of work. Mark Davis: Early nanoparticles mainly accumulated in the liver, and through a variety of different labs including our own, we now know that accumulation depends on their size. Smaller is better. We also know that the electrical charge you put on these nanoparticles is very important. We found that if you have a surface charge between zero and –10 mV, it helps the nanoparticle avoid uptake in the liver — but if you go more negative or positive, it doesn’t. We’ve learned a lot, so now there are design rules about how to make nanoparticles circulate better to minimize them going to the liver and spleen and instead have more of them reach tumors. But do those design rules transfer to a human? We don’t know the answer to that yet. There just isn’t enough data at this point, and it’s really hard to get data from patients. We’d love to be able to tag the particles and see where they are going in patients, but that requires a lot of financial resources. Very little of this information is currently being collected in clinical trials. Based in Oxnard, CA, The Kavli Foundation (TKF) is dedicated to advancing science for the benefit of humanity and promoting increased public understanding and support for scientists and their work. Its mission is implemented through an international program of research institutes, professorships, and symposia in the fields of astrophysics, nanoscience, neuroscience, and theoretical physics as well as prizes in the fields of astrophysics, nanoscience, and neuroscience. TKF was established in December 2000 by its founder and chairman, Fred Kavli, a California business leader and noted philanthropist, whose foundation has established major research institutes at leading universities and institutions in the United States, Europe, and Asia. A Norwegian-born physicist, Fred Kavli is founder, former chairman, and chief executive officer of Kavlico Corporation in Moorpark, CA. When he sold the company in 2000, Kavlico was one of the world’s largest suppliers of sensors for aeronautics, automotive, and industrial applications. y, the Chinese Academy of Sciences, Harvard University, the University of Cambridge, the Norwegian University of Science and Technology, and the University of Tokyo in Japan. And six Kavli professorships have been established: two at UCSB, one at University of California Los Angeles, one at the University of California Irvine, one at Columbia University, and one at the California Institute of Technology. Michael Phelps: We’re all dependent upon each other. If Mark had a way to give a test dose and measure if the tumor responded to it (so he could switch to a different drug if it didn’t respond), that would make his life — as well as the patient’s life — a lot better. That’s exactly what we do with PET. We can label the nanoparticle with an imaging probe so that a test dose can be given to a patient, and a PET scan can be used to see if the drug has reached its target and a therapeutic response has occurred. It is critically important to increase the number of measurements that we can translate from our preclinical sciences into patients. TKF: The FDA is concerned about where these nanoparticles end up in patient’s bodies and about the need to show this accurately. Are you saying you can address this with PET imaging? Michael Phelps: Yes. All of us developing therapeutics want to have a transparent patient — to see where the drug goes throughout all tissues of the body, whether it hits the disease target in a sufficient dose to induce the desired therapeutic effect on the target, and where else the drug goes in the body regarding side effects. PET can reveal all this. For this reason almost all drug companies now use PET in their discovery and development processes. Mark Davis: There’s so much cool science that people want to do, but you’re limited in what you can do in patients for a number of reasons. One is financial. This area is not being pushed forward by big pharma, but by biotech companies, and they have limited resources. Second, the FDA is still learning about these innovations, they can limit what you are allowed to do in a clinical trial. For example, when we did the first clinical trial with a nanoparticle that had a targeting agent enabling it to latch onto a specific receptor on cancer cells and a gene silencing payload, we realized it would be important to know if patients have this receptor and the gene target of the payload to begin with. Prebiopsies from patients before testing the nanotherapeutic on them to see if the tumor cells had this receptor and gene target in abundance would have been helpful. However, in this first-in-man trial, the FDA did not allow required biopsies, and they were performed on a volunteer-basis only. Anna Barker: The FDA doesn’t yet have a sense of how different the drug development and testing has to be for nanotechnologies. We need a group at the FDA that actually works on nanoconstructs specifically because it’s such a different set of questions that we’re dealing with now, and the drug industry is kind of waiting on the sidelines to see how the FDA will deal with a drug like Mark’s. It may take an entirely new way of developing these agents, which requires a new way for the FDA to review and approve them. We’ve worked a lot on that, but it’s a slow slog in terms of getting the needed changes. Although the FDA has spent an enormous amount of time and effort on this in the last four or five years, it has too many things on its plate. The FDA regulates 28% of all gross domestic products, and drugs are a very small portion of what they oversee. They don’t have the money or staff to actually hone in on nanotechnology. Michael Phelps: But the problem is not just the FDA. The whole pharmaceutical discovery and development processes are collapsing under their own financial and bureaucratic weight. Over the last five years or so, the pharmaceutical industry has laid off about 200,000 people and is likely to lay off more people. This is a time of great socioeconomic change with the need for new people with new ideas going in new directions, both in academia and industry. An interesting experiment would be to establish an FDA drug and diagnostics review process restricted to nonprofits that would also be evidence-based, but would consider different types of evidence (direct measurements of the biology of disease) while the FDA continues on with the present process for commercial companies. James Heath: To get an appreciation for how conservative the FDA is, it’s been clear for over a decade that a single diagnostic test was likely to include multiple separate measurements, such as measurements of a half-dozen protein biomarkers. The FDA promised about a decade ago that they were going to release guidelines to assist in the development and eventual approval of such multiparameter disease diagnostics. Those guidelines still haven’t come out. Anna Barker: Nanotechnology brings so many new elements to diagnostics and therapeutics, so many new ways of thinking, that are not included or considered in the current FDA guidances. We do need some kind of “sea change” here that will focus on capturing more information more specifically, whether you are diagnosing a patient or delivering a drug to a patient — or actually trying to use a biosensor that will allow you to prevent a disease. We’re not set up to do that. Until you get those changes, every nanotechnology diagnostic or therapeutic is going to have an extremely hard way to go because the level of evidence has to be so much higher than for the kinds of things they normally see. TKF: The level of evidence has to be so much higher because there are so many unknowns involved with nanotechnology. Do you think the FDA is concerned that nanoparticles might have their own unique safety issues? Mark Davis: The issue of safety from a medical point is quite rigorous. There’s an unbelievable amount of testing in animals before you go into humans. Drug companies do a much better job testing nanotechnologies for safety than the other industries that make nanoparticles. Nanoparticles are already commercial entities. They’re in sunscreens, paints, and they’re even talking about putting them in light bulbs. But none of these products have gone through the rigorous testing that nanoparticles used in medicine undergo. The hurdles are just so high for the medical community compared to all the other entities that are using nanoparticles. You also have to put it in context. Most of these nanoparticles being used in medicine are being used in cancer patients for whom the benefit-to-risk ratio is pretty high. Can and should we continue to attempt to do better? Of course. But we should not let overregulation be an impediment to progress. Anna Barker: I agree. Most clinicians aren’t using traditional doxorubicin chemotherapy, but (instead) the nanoconstructs of that cancer drug (because it’s safer). ducing the toxicity for patients. 1.) Ratner, M, and D. Ratner. 2003.Nanotechnology: A Gentle Introduction to the Next Big Idea, Prentice Hall. 2.) Jones, RAL. 2004.Soft Machines: Nanotechnology and Life, Oxford University Press. 3.) Nanotechnology: Big Things from a Tiny World, National Nanotechnology Coordination Office, Arlington. 4.) 2011. FDA Opens Dialogue on “Nano” Regulation, FDA Consumer Health Information. 5.) Seeman, NC 2004. Nanotechnology and the Double Helix. Sci. Amer www.scientificamerican.com/article.cfm?id=nanotechnology-and-the-do.. 6.) Greenemeier, L. 2009. 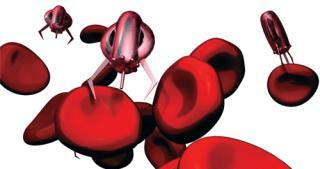 Preying On a Tumor’s Weakness with Nanotechnology to Fight Cancer. Sci. Amer www.scientificamerican.com/article.cfm?id=gold-nanotech-fights-cancer.. 7.) Greenemeier, L. 2008. For Nanotech Drug Delivery, Size Doesn’t Matter — Shape Does. Sci. Amer www.scientificamerican.com/article.cfm?id=size-shape-matter-nanotech-drug.. 8.) Khademhosseini, A, JP Vacanti, and R. Langer. 2009. How to Grow New Organs. Sci. Amer www.scientificamerican.com/article.cfm?id=how-to-grow-new-organs.. 9.) Gould, SE 2011. Using Nature’s Machines. Sci. Amer http://blogs.scientificamerican.com/lab-rat/2011/07/18/using-natures-machines.. 10.) Greenemeier, L. 2008. Nanotech to Regrow Cartilage and Soothe Aching Knees. Sci. Amer www.scientificamerican.com/article.cfm?id=nanotech-cartilage..